I thought the piece overall was good as an example of the kind of forward thinking and goal-setting the Branch needs to engage in, but I did have some problems with its specific predictions and wanted to present an alternative view, lest the Fellow Worker’s writing be misunderstood as current Branch policy rather than his personal opinion. Hopefully both of our ideas on the future direction of the Branch will encourage Branch-wide dialogue on the subject, and get the rest of our membership thinking more about long-term strategy. The Fellow Worker hopes that an Industrial Organising Committee in the Hospitality Sector will comprise some 20% of our Branch’s membership in 2020, with a further 20% in Education and Health/Social Care. I found these projections surprising, for a number of reasons. Firstly, such a heavily weighted focus on hospitality workers in no way reflects the demographic and economic reality of our region. Below is an infographic I have created using employment data from the 2010 ONS Population Survey for Yorkshire and the Humber. Hospitality workers (contained here as a subset of “Leisure, Travel and Personal Service” workers [dark yellow]), according to this data, make up less than 2% of the workforce in our area of operations. Teaching and Education workers [light purple] make up just 4.8% of the workforce. Health and Social Care workers [various shades of blue] fare slightly better, clocking in at 14% of the workforce if all types of medical professional and social worker are included. By contrast, workers in Manufacturing, Trades and Agriculture [various shades of red] comprise almost a quarter of all workers in Yorkshire and the Humber; they do not get a look in or even a mention in our Fellow Worker’s 5-Year Plan. Likewise, the largest single group of workers, those in Elementary Administrative and Service roles [light yellow], receive only a token nod as “public admin”; we are invited to hope that just 25 of them join us over the next 5 years. For these three sectors – but especially Hospitality – to be touted as hopeful flagship industries for the Sheffield IWW reflects a disproportionate preoccupation with a relatively tiny section of the workforce. These industries, like all others, do need to be organised. However, to focus our short- and medium-term resources (our outreach activities, the deployment of our salters [workplace infiltrators], our national funding requests etc.) on them at the expense of other sectors is to ignore the vast majority of workers in our region. If our aim is massive, near-exponential growth of membership (it is), why would we prioritise one of the smallest sectors with the fewest workers, over all else? It is lucky for us, of course, that we don’t in fact have to pick and choose. 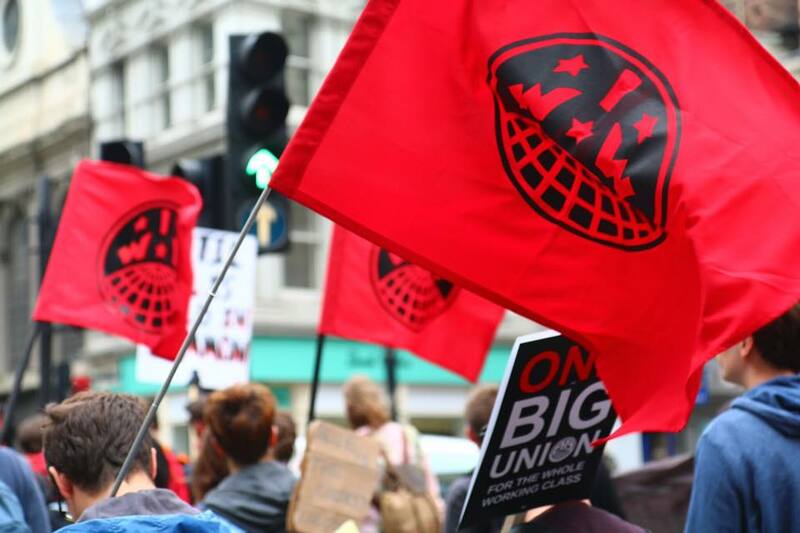 The IWW will organise whoever it can, wherever it can, in every industry and region under the Sun – and this has been a pillar of our organising strategy for over a century. That said, at Branch level, we do have real decisions to make about our outreach and salting priorities in the short- to medium- term, and these decisions should be informed by the economic realities of our region first and foremost. So far I have made the case that the Hospitality sector is the wrong hill for us to die on, statistically speaking and from a growth perspective. However, completely apart from the numerical argument, diving headlong into Hospitality, Education and Healthcare at the expense of e.g. Manufacturing, Retail and Agriculture is ill-judged from the standpoint of grand syndicalist strategy, too. Our long-term aim, as determined by the IWW Constitution as well as by the more detailed analysis of our own major theorists (Haywood, Ralph Chaplin, etc.) and theorists from sympathetic perspectives (Rudolph Rocker, Tom Brown, etc. ), is to build sufficient forces within such parts of the productive economy as will make feasible a Revolutionary General Strike against the entire capitalist class in pursuit of permanent workplace democracy and the collective ownership of the means of production. We are a union that is preparing for revolution, and the strategic decisions we make with regard to our hubs of organising and outreach should always be in dialogue with that deadly serious fact. To be sure, we envision a world where all hospitality workers and all teachers control their own working environments without the systematic exploitation of bosses and owners. But all sectors of the economy do not play an equal role in materially sustaining the capitalist system. The fully-fledged General Strike is always a battle of attrition – who will cave in first, the bosses (and their friends in government) or the workers? In Britain in 1926, it was the workers; in Spain in 1936 it was (temporarily, at least) the bosses – the outcome is never certain, and in the final analysis is often largely contingent on the material supremacy of either side. Ask yourself: if every hotel and every school in the country went into indefinite Stay-In Strike whilst British factory and farm workers continued to churn out food, armaments, clothing, vehicles and machinery for the bosses, or whilst British dockers and sailors continued to import these goods from overseas, would the capitalist class weather the storm? Now ask yourself the same question in reverse. In neither case is it possible to say with certainty that the workers will definitely win, but it is abundantly clear that, for example, the production and/or acquisition of e.g. wheat, steel, petrol, etc., play a far greater role in the day-to-day maintenance of the capitalist economy than, e.g., the availability of hotel rooms. We can massively increase our chances of success by concentrating our organising at the economy’s most critical bottlenecks: the sectors and regions which are most likely to play a pivotal role in the rapid capitulation of the exploiting class at the moment of General Strike. Elsewhere, this principle has been called “Pinch-Point Organising”, and it strikes me as common sense for any group which seriously hopes to bring about the expropriation of the capitalist class by direct action. It does not imply, as some of its critics suggest, that we should not support, train and develop organisers in the tertiary sector – we absolutely should, and we do already. All that it prescribes is a realistic appreciation of the scale and adversity of our long-term tasks, and the adaption of our strategy to existing economic realities. Our Fellow Worker’s 5-Year Plan rightly calls for the demographic composition of Sheffield, in terms of both gender and ethnicity, to be reflected more perfectly in the composition of the Branch by 2020. I cannot fault him for this, but I would add that a huge proportion of Sheffield’s migrant and foreign workers are employed in the archipelago of vast factories and warehouses which encircle our city – workplaces which do not feature heavily in the projections which have been made. It is well and good to wring our hands about a perceived lack of diversity in the Branch – but we may do so until we are blue in the face unless we are prepared to actively organise in more ethnically diverse economic sectors. By way of illustration, just 6% of British teachers – one of the three most significant sectors in the Fellow Worker’s plan – are non-white. Sector prioritisation in this 5-Year Plan therefore betrays a slight disconnect between the desire to improve representation for minority workers, and the appreciation of where those minority workers actually are in the economy. If we say we want better diversity in 5 years, but then pour heart and soul into disproportionately white sectors, we are setting ourselves up to have the same troubled discussion in 2020. I am in total agreement with our Fellow Worker’s argument that our outreach and membership growth must increasingly target our regional periphery, including lasting and effective outreach in Rotherham, Doncaster and other metropolitan, suburban and rural areas bordering Sheffield – as well as a concerted push towards Lincolnshire, the country’s largest producer of wheat and many other food and agricultural staples. The Branch Outreach Committee is currently working on a comprehensive overhaul of our current outreach strategy which is geared towards increased activity in the periphery, as virtually all of our public activity is currently confined to a small radius within the city. It will be exciting to see how this outward-looking strategy develops, and whether it pays dividends in membership growth and industrial diversifaction. Despite constant and impressive growth and a number of major casework victories, Sheffield IWW is still flying somewhat blind with regard to the economic and social geography and demography of its area of operations – elements of this problem are reflected in our Fellow Worker’s proposed 5-Year Plan. For this reason, I present an Alternative 5-Year Plan for general consideration. 1. A geographically-targeted public outreach programme guided by thorough research on the major sites of employment in Sheffield’s impoverished peripheral neighbourhoods, with a special focus on Sheffield’s comparatively large and diverse manufacturing, distribution, construction and trades sectors. Specifically aim to double Branch membership year-on-year until at least 2025. 2. One major factory/warehouse/industrial facility per year partly or fully organised under the IWW. Each one of Sheffield’s scores of enormous manufacturing and distribution sites employ literally hundreds of workers per site – numerically each factory is the equivalent of an entire street of shops or hotels – these workers are also overwhelmingly non-British, and generally employed in some of the most dangerous, exploitive and poorly-paid conditions in the city. 3. Continued commitment to the development of all organisers and members throughout the tertiary sector, but not at the expense of desperately needed, rapid “catch-up” outreach to workers in manufacturing and heavy industry, who, by percentage of population are chronically under-represented in the Branch. 4. As a consequence of concentrated peripheral factory organising, I would like to see individual chartered IUBs with national voting rights, functional officer mandates and regular reports to the GMB in several different major manufacturing sites around Sheffield, as well as multiple healthy chartered workplace committees in our existing Health and Social Care strongholds, and a marked growth in retail, service and elementary administrative organising. The composition of the branch should roughly reflect the composition of the regional economy. 5. A concerted effort to improve co-ordinated salting on the same key job sites by Branch members, especially as more of the Branch’s student members graduate and have to seek full-time employment. 6. A definite eastward push culminating in the establishment of a functioning GMB in Lincoln with membership from the surrounding countryside, in order to forge a concrete link between the agricultural workers in Lincolnshire who feed us, and we in Sheffield, Rotherham etc., who produce and deliver a lot of their equipment. This should lead to a direct understanding of the movement of pinch-point commodities in and out of Sheffield, as well as the presence of militants and organisers at key points in this system. Many of the suggestions made both in my Fellow Worker’s plan and my own are not mutually exclusive. We both want to see explosive growth and regional expansion, and should not be taken as seriously disagreeing on the overall aims and principles of the union. This article is a friendly response, and I hope both articles will stir discussion amongst everyone about our short- to medium- term strategy, which, as always, is ultimately governed by the directly democratic decision-making of the entire Branch. Taken from Steel City Syndicalist blog. It's been interesting to see this debate - and just generally good to see debates about workplace and organizing strategy happening full stop. That said, I think there's something to be said about organizing where you're out. In the first proposal (the one this is responding to), I believe those particular industries were prioritized because that's where the branch currently has members. Of course, outreach is a good thing, but we (and I speak here as a not very active Wob) need to learn how to organizing effectively in our own jobs and in our own industries before we can get to the point that we can start targeting industries where we have few to no members. The second thing - and I hope this doesn't come across too harsh - believing now that the organizing we do now is somehow related to some future general strike... If a proper war-of-attrition, overthrowing capitalism general strike is going to occur, it's going to be the result of a massive radicalization of the working class. I'd hope the IWW would be a part of that but, man, talk about running before you can walk - that's like building the matter teleporter before you can walk.